Waterlog readers should be no strangers to Macintosh, whose Travels in the White Man’s Grave was reviewed some time ago, and who has occasionally contributed to the magazine. Donald has had a more varied life than most, prospecting for trees in rain forests from Liberia to Cameroon and living with companions ranging from tribal elephant hunters to pygmies, although we would stress that the latter worked for another angling publication. 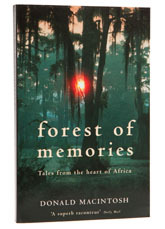 Forest of Memories is Donald’s forth book and draws from an apparently infinite fund of stories, ranging from the unexpected catch of an electric catfish, through a fishing baboon (we get those in Durham, too), to the tale of Old Nell, who lost her horse to rustlers and took a whip to the culprits. Only a few of the tales are about fishing, but the book is definitely up to Donald’s usual standard. As usual, funny and affecting by turns.